Rural living, yet only minutes to town. 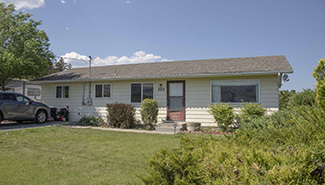 Move-in ready rancher with three bedrooms and a den that sits on a flat 0.27 acre lot backing onto a cherry orchard. Virtually half of the property on the east side of the house is bare land and makes a great yard or would be ideal for an addition or detached garage. Spacious master bedroom has a walk-in closet. The den with sliding door opens to the private back patio looking onto the orchard. Solid surface flooring throughout, built-in eating nook, ductless heat-pump. Roof was replaced 4 years ago. RV parking and garden shed. Quick possession.